Allow multiple Students & Teachers to Tweet from a private or public Twitter account. Moderation functionality available. Students or teachers simply include your school hashtag or keyword in a Tweet and it will be Tweeted out from the school/class account. One click Tweet moderation is available if you wish to approve messages first. If students/teachers don't have personal Twitter accounts they can login to your school or class's private GroupTweet page w/ email address. Secure your school or class account by not sharing the password. GroupTweet's built in moderation feature is the perfect way to teach responsible social media use to your students. Build school spirit and highlight student/faculty success stories. GroupTweet provides a full audit trail of published Tweets so you know which contributor sent each Tweet if the need arises. Active school Twitter accounts with multiple contributors will engage your community. GroupTweet has been awesome for our classroom discussion. It provides the perfect backchannel and allows all students in the class to have a voice and be heard. Do you like the idea of having multiple students Tweet from a class Twitter account, but still want full control over the content of what gets Tweeted? Message moderation allows you to approve messages with one click from your email before they are Tweeted out to the public. Some teachers prefer creating a private Twitter account for their class discussion. Others prefer keeping it public and connecting with other classroom's on Twitter. With GroupTweet, you can create a private or public classroom Twitter account that will stimulate discussion in and outside the classroom. Having a class account that centralizes the discussion under a single timeline is a much better experience than simply using a class hashtag. A class Twitter account promotes conversation and engagement. With GroupTweet, students can easily see each other student's Tweets without having to perform hashtag searches. They simply follow the class account! 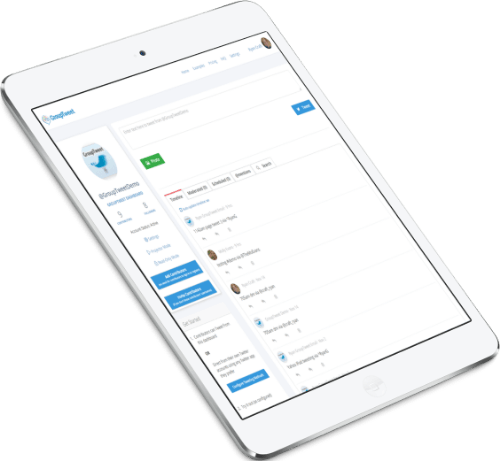 GroupTweet is perfect for allowing multiple teachers or administrators Tweet from your official school account. It's a challenge convincing teachers to take the time to write posts for the school blog or website. However, with GroupTweet it's super easy to have them contribute content to the school account. They simply send a Tweet like they normally would and add the school hashtag! Or alternatively they can easily login to the GroupTweet dashboard.